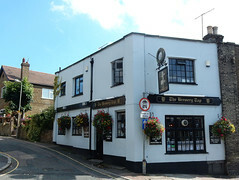 It's a small, single-room corner pub which nevertheless feels reasonably spacious, as most of the interior is given over to standing room. It was presumably once either larger or divided in two, as the sole entrance door bears a brass plaque reading "Saloon Bar". There's a rather nice patio beer garden out the back. The decor is traditional but not dated, with geometric designs on the upholstered banquettes and their accompanying padded stools. Dark wood is everywhere, from the flooring to the tables and the gantried bar. Dried flower arrangements stand in vases on the windowsills. There's at least three flatscreens. Kake visited on a Friday lunchtime in September 2015. Arriving just after the opening time of noon, I was the second customer of the day. Other people continued to arrive, seemingly mostly regulars, and by the time I left an hour later the garden was half-full and it was relatively lively even inside. Music was playing, quite quietly, and frequently drowned out by traffic on the (not overly busy) road outside. The flatscreens were showing cricket with the sound off. There were five real ales on: Wells Try Time, Timothy Taylor Landlord, Greene King IPA, Adnams Ghost Ship, and Fuller's London Pride. A pint of lime and soda was £1. Service was friendly and welcoming. According to the Brewery Tap website as of September 2015, food is served noon-2pm Mon-Fri, and consists of sandwiches, toasted sandwiches, and jacket potatoes. Kake tried the prawn mayonnaise sandwich (£4.50 including curly fries and salad garnish) photo. This arrived with an impressive array of condiments including roasted garlic mayo, mustard mayo, and chilli ketchup. Although the bread options had been listed to me as granary bread or white sub roll, it actually came on seeded bread rather than granary, which I much preferred. The prawns inside the sandwich were plump and plentiful. The curly fries were fine, and just the right amount. According to a notice seen in September 2015, children and dogs are allowed "at the management's discretion". Accessibility: An attempt has been made at a step-free entrance, with a partial filling-in of the gap between pavement and threshold, but there's still part of the step left exposed. There's not a huge amount of interior seating. Once you're in, there's no steps to the toilets but they're quite cramped. There are several steps to the beer garden. Last visited by Kake, September 2015. Opening hours taken from the Brewery Tap website, September 2015. Page last edited 2015-09-24 15:07:25 (version 1).